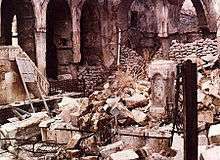 The 1947 Anti-Jewish riots in Aleppo were an attack against Jews in Aleppo, Syria in December 1947, following the United Nations vote in favor of partitioning Palestine. The attack, a part of anti-Jewish wave of unrest across Middle East and North Africa, resulted in some 75 Jews murdered and several hundred wounded. In the aftermath of the riots, half the city's Jewish population fled the city. Syria gained independence from France in April 1946. The Haganah's illegal immigration operative Akiva Feinstein wrote in 1947 that the government commenced persecuting the Jewish minority, and that all Jewish clerks working for the French bureaucracy were fired and the government tried to stifle Jewish businesses. At the time of the United Nations vote on November 29, 1947, the Jewish community in Aleppo numbered around 10,000 and went back around two thousand years. After the vote in favor of the partition of Palestine, the Syrian Government abetted and organized Aleppo's Arab inhabitants to attack the city's Jewish population. The exact number of those killed remains unknown, but estimates of those killed are put at around 75, with several hundred Jews wounded. Ten synagogues, five schools, an orphanage and a youth club, along with various Jewish shops and 150 houses were set ablaze and destroyed. Damaged property was estimated to be valued at US$2.5m. During the pogrom the Aleppo Codex, an important medieval manuscript of the Torah was lost and feared destroyed. The book reappeared (with pages missing) in Israel in 1958. Following the attack, the Jewish community went into a steep decline. The wealthy Jews escaped the day after the pogrom and many more fled in small groups in subsequent months. Their property was forfeited and on December 22 the Syrian Government enacted a law forbidding Jews from selling their property. Within years after the pogroms, most Jews left Aleppo, a large majority of them to Israel. By 1959, about 2,000 Jews remained in Aleppo. As of 2012, no Jews live in Aleppo. 1 2 Jacob Freid (1962). Jews in the modern world. Twayne Publishers. p. 68. Retrieved 18 October 2010. 1 2 Colin Shindler (2008). A history of modern Israel. Cambridge University Press. p. 63. ISBN 978-0-521-61538-9. Retrieved 18 October 2010. 1 2 3 4 Itamar Leṿin (2001). Locked doors: the seizure of Jewish property in Arab countries. Greenwood Publishing Group. pp. 167–171. ISBN 978-0-275-97134-2. Retrieved 18 October 2010. 1 2 3 4 Friedman, Matti (May 15, 2012). "A Different History of Displacement and Loss: There is More Than one way to look at the Commemoration of 1948′s Palestinian Defeat and Dispersion". The Times of Israel. Retrieved 15 May 2014. 1 2 Hayim Tawil; Bernard Schneider (December 2009). Crown of Aleppo: The Mystery of the Oldest Hebrew Bible Codex. Jewish Publication Society. p. 163. ISBN 978-0-8276-0895-5. Retrieved 18 October 2010. ↑ Daniel Pipes, Greater Syria: The History of an Ambition, (New York: Oxford University Press, 1990) p. 57, records 75 victims of the Aleppo massacre. ↑ Benny Morris (2008). 1948: a history of the first Arab-Israeli war. Yale University Press. p. 412. Retrieved 18 October 2010. ↑ Andrew G. Bostom (2008). The legacy of Islamic antisemitism: from sacred texts to solemn history. Prometheus Books. p. 159. Retrieved 18 October 2010. ↑ W. A. Veenhoven (February 1977). Case Studies on Human Rights And Fundamental Freedoms. Martinus Nijhoff Publishers. p. 90. ISBN 978-90-247-1957-0. Retrieved 18 October 2010.